This one of course is Darth Maul’s! The PVC pipe version (shown in this post), which will require a little more time, and a trip to Home Depot (this is a modified version of M4P Mom’s idea). The original, simple version suggested by my mom. This one you can do with your kids, with supplies you probably already have at home. You can find that post here. Cut the PVC pipe into 4.5″ pieces. Sand the cut edges to smooth any sharp parts. Wipe clean with wet cloth. Let dry. Stand hilts up on end, spray paint with grey primer. Let dry. Turn to other side. Repeat. Spray with silver paint (black for Kylo Ren). Let dry. Cut buttons, and strips out of the tape. Decorate hilts with electrical and Duct tape. 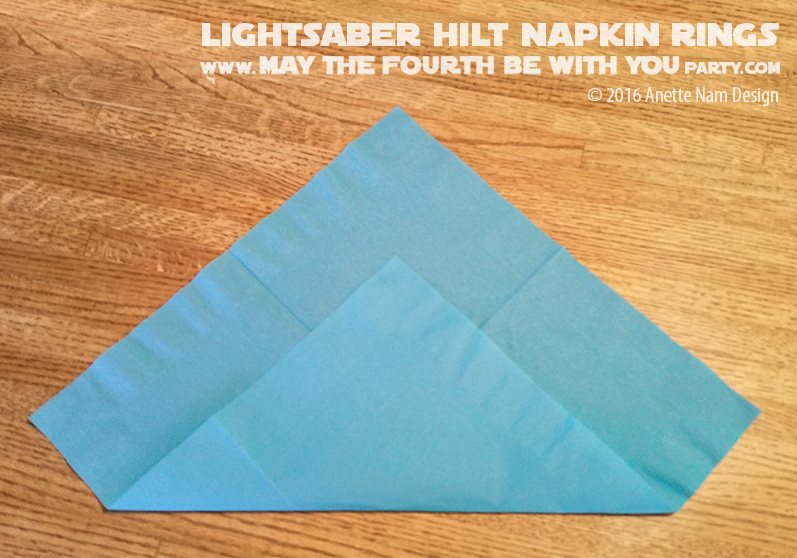 Open up the napkin to a large square (diamond). Starting on one of the side corners, roll into a tight tube. 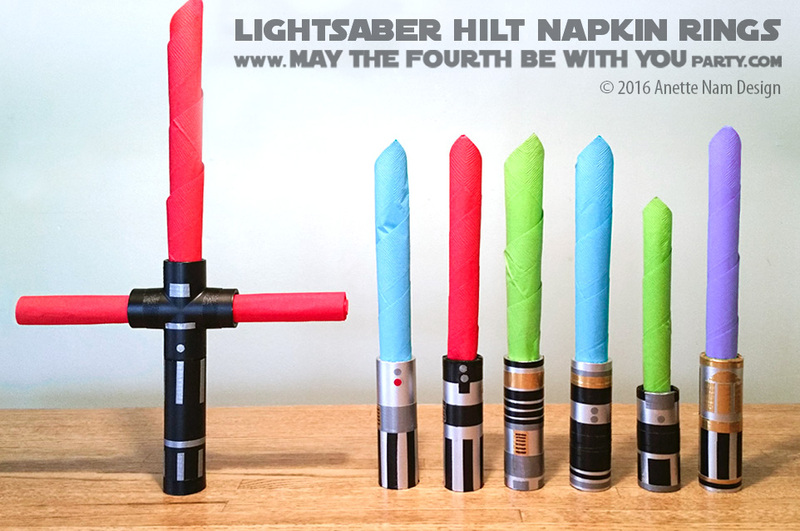 Insert into lightsaber hilt, and shake around a bit until the napkin tube expands enough to fit snuggly into the hilt. We used a hole punch for the buttons. And trust me, Duct tape is MUCH easier to cut with a hole punch than electrical tape. Using an X-acto knife, cutting mat and a C-through ruler to cut, saves the time of having to measure everything when cutting – it will make your life A LOT easier! Absolutely worth the investment if you do a lot of crafts. Those are awesome! My little brother was looking at this with me and just kept on asking me to make them. THANKS!!! They were so much fun to make! I will give you a hint about next week’s post: Paper towel rolls and duct tape instead of PVC pipes and spray paint! So easy your brother can make them himself 🙂 I am hoping to have photos and instructions up next Wed. This makes me wish I was artsy and crafty (I lose patience most of the time) but I am excited for the paper towel rolls post. That still may be too much work for me but can I just say – I LOVE THESE. So cool! Do you live in Massachusetts? I would totally hire you to do my birthday party or something lol. Oh trust me, I lose patience too. I love making a “mess”, but hate cleaning up… hate it with a passion!!! And sorry, no, I don’t live anywhere near you. But I am thrilled that you like our ideas! !